Midfielder Ryan Stevenson thinks Gary Locke has earned the right to manage Hearts in more stable times after a year of struggle in administration. A creditors' agreement in Lithuania this week set the Edinburgh club down the path towards a takeover by local businesswoman Ann Budge. But relegation means they will be playing in the Championship next term. "He's had his hands and his legs tied," Stevenson said of Locke. "It would only be fair if he gets a crack at it." Edinburgh-born Locke, the former midfielder with Hearts, Bradford City and Kilmarnock, returned to Tynecastle in 2010 as first-team coach under Jim Jefferies. He took charge of the team in February 2013 following the exit of John McGlynn and his side, having started by a 15-point penalty and a signing embargo for being in administration, will finish bottom of the Scottish Premiership. But Stevenson believes the 38-year-old's passion for the club makes Locke the ideal man to lead them in next season's Championship campaign. "The manager himself is in his dream job," the midfielder told BBC Scotland. 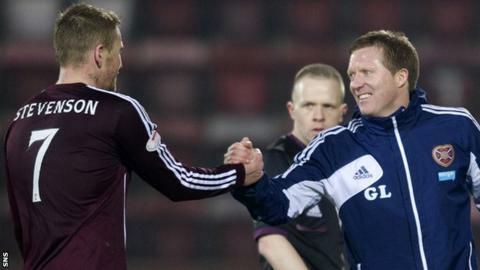 "Everyone knows how he feels about the club, how his family is, he's Hearts through and through. "For him to be manager is probably the proudest thing in his life outside probably his kids. "For him to have to deal with what he's had to deal with this year in his first job has been nothing short of remarkable. "The way he's dealt with it day-in, day-out, the way he's been with the players, the way he's been with everyone, he's a credit to himself and he's a credit to this club." Stevenson says there is not just sentimentality behind his opinion of Locke. "Taking all that aside, he's a tremendous coach and a good, good manager and I think he's only going to get better," he said. "Hopefully, if Mrs Budge comes in and he's the man to lead us forward, which I hope it is, he gets his chance to put the stamp on things. I have massive respect for him." Budge will complete the process to formally take Hearts out of administration next month after striking a £2.5m deal to buy shares from major creditor Ukio Bankas on Wednesday. There has been speculation that the 66-year-old millionaire IT specialist and wants to bring in former Hearts manager Craig Levein when the current manager's contract expires this summer. Locke, who has yet to speak with Budge about her future plans, said: "Ann will know what she wants to do. "I have tried to do the best job I possibly can under really difficult circumstances. "But, like any club that gets new owners, they will have their own ideas, so we will just wait and see what happens. "I keep saying it is not about me. The only thing that bothers me is that the football club is still here."